I became interested in modeling around 1955 when I was eleven years old. 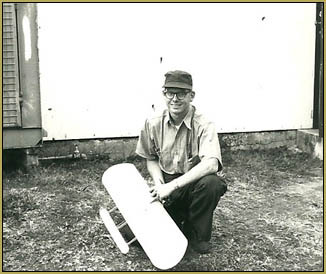 The father of the guys I hung around with built U-control and free-flight models. He helped me build my first U-control model and taught me how to fly it. He had some huge free-flight models that we flew in a large field behind our houses. That field today is part of the Northrop Aircraft Company in Inglewood, CA. My interest in modeling was put on hold while in high school. It was rekindled again when I was stationed at NS Sangley Point, Philippines in 1964-65 with a Navy Patrol Squadron. Some of the guys and myself built and flew combat U-control planes in our spare time. After Kathy and I got married in 1965 I got interested in RC models. My first radio was a Kraft 4 channel that was installed in a high wing trainer powered be a Fox 35 engine. It was an expensive learning process because I taught myself to fly. When we moved to Corona, CA I joined the Corona RC club and spent most of my weekends there flying. One day Kathy put her foot down and said she was tired of sitting home and wanted me to teach her to fly. After some discussion we decided it would be best for our marriage if one of the other guys taught her to fly. It wasn’t long before she had multiple aircraft of her own and became a big hit with the club. In the summer she would come out and fly in short shorts and a bikini top. The guys obviously went home and told their wives, because it wasn’t long before a few of them started showing up to see what the heck was going on out at the field. Soon after there were a few more women pilots flying in the Corona RC Club! We flew in a few contests and one of the biggest at the time was an annual fly-in at Miles Square Park in Huntington Bach, CA. She won both the bomb drop and spot landing contest at Mile Square park fly-in, the only woman to compete. 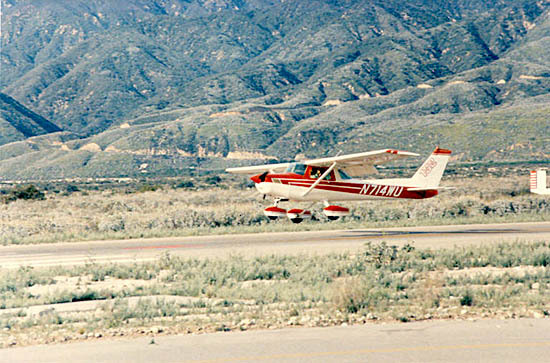 When we moved to Redlands, CA in 1984 the models were put aside and we both took flying lessons and learned how to fly. 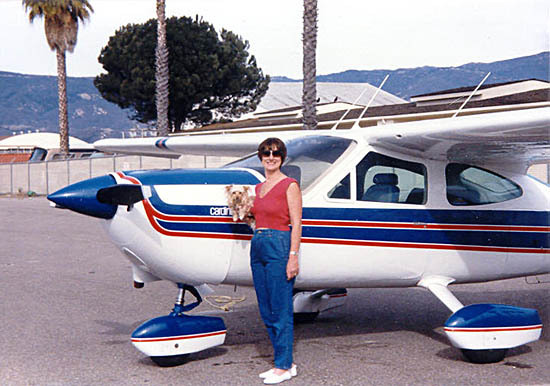 We bought a Cessna 152II and flew it all over So Cal. Two years later we traded it for a Cessna Cardinal and flew it almost every weekend for a little over 5 years. We had over 3500 hours logged flight time when we finally sold our beloved Cardinal. After we both retired in 2003 we moved to Quartzsite, AZ. There we met a couple of guys who were flying RC planes off a dirt field. Seeing them fly got us both hooked again and we bought a radio and one airplane. Quartzsite in the winter is full of Snowbirds, and one by one the group started getting bigger and bigger, and soon the Quartzsite Desert Flyers was born. 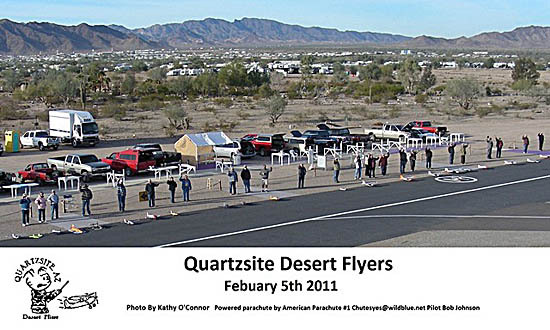 The town of Quartzsite took an interest in the RC hobby and helped with giving the club a portion of the town park, complete with a 600 foot blacktop runway. The club last year had well over 100 members, probably 95% Snowbirds who go North when the temps hit the 80’s. We still return there to fly every February for the annual Fun Fly. It has become one of the major events of the town and has a huge attendance. We are excited to once again have a new place to fly and are looking forward to many happy landings with the Golden Eagles. 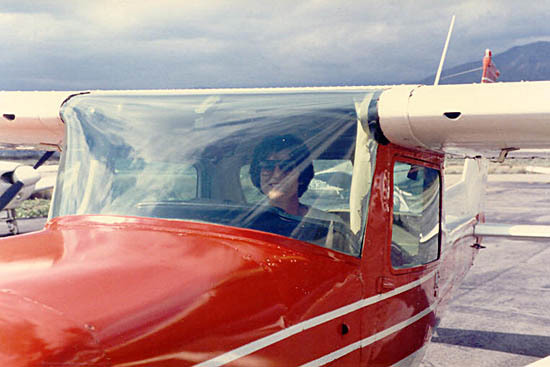 Kathy before her Solo flight. Our friends in Quartzsite. We’re the last two on the left. 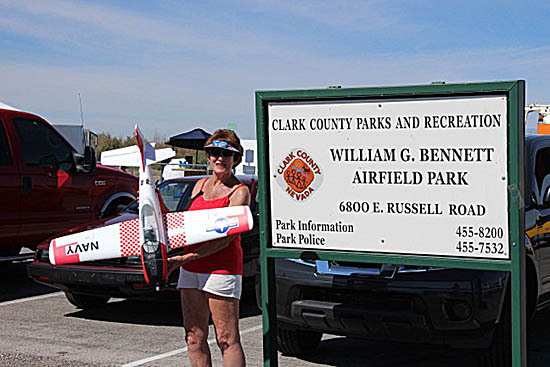 Kathy was the only woman pilot at the 2014 Ace in the Hole Fly-in in Las Vegas. Her left elevator was chopped off by a 3D plane. Styrofoam went every where! She made a perfect landing back on the runway to the cheers of over 200 people. Very nice article I enjoyed it very much welcome to the golden eagles hope to see you guys out there. Certainly not too long. It’s suppose to be longer. It’s about 2 pilots/members.